It is a fair question in some ways but, it is because of the fallen and still falling world that Jesus is needed more and more in our lives. The question “Why do we need Jesus Christ in our lives?” becomes blatantly clear when we step back and take a closer look at who we are, what surrounds us and what our eternal future will be once life on earth has ended. Why do we need Jesus Christ in our lives? No matter what anyone says the Jesus Christ is Truth, or rather, the Truth is in Him. Without Jesus Christ, the real truth in anything can never be attained or even understood. In Christ, all the treasures of wisdom and knowledge are found (Colossians 2:3 Ephesians 4:21). In life to truly make sense of anything you need Christ. The opposite of life is death, and no one can escape it. Scientists tell us that we are dying every day, but they have no answers to what happens when we die. Through His resurrection, Christ defeated death to allow any man to follow after Him. Improved daily life and health regeneration each day is promised through Jesus Christ. 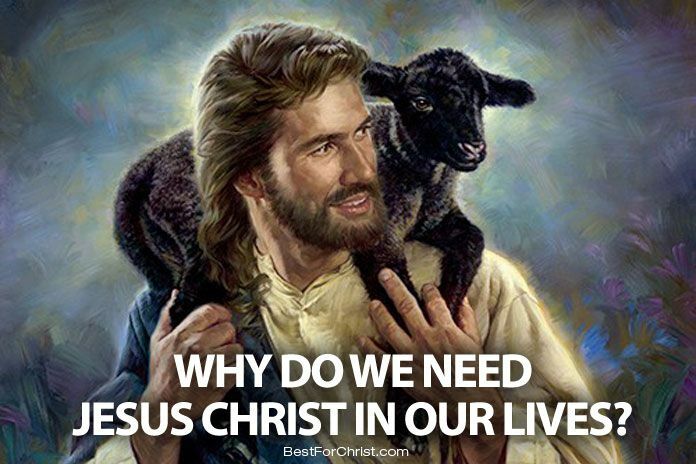 Why do we need Jesus Christ in our lives? Ask yourself if you want a better life? We were born sinners, and no of us are perfect. Through Christ our sins have been forgiven, all sins are accounted for, but without Christ, the sins are not in your favour. Christ is needed to atone for our sins (Romans 5:11), and we need Him to be our mediator with God (1 Timothy 2:5). In life, we need Jesus Christ in us and by our side because sin is always present. Next to peace the one thing that drives all human beings is hope. The only hope anyone has in life without Christ is to seek a life with as much pleasure before life ends. Christ gives us so much more than this; He gives us hope of eternal glory, more than we can ever dream or ever try to own. Surely, without Christ live is just pure vanity? Scripture says we will have suffering in this world and for much of the pain that comes along with suffering there is little that helps. The answer to suffering is found in your question “why do we need Jesus Christ in our lives?”. Christ provides supreme comfort when it comes to suffering, and the peace that comes through Him is part of what eases the suffering we experience. Sometimes we need to dig deep to find the strength to even wake up in the morning. Life can be tough and often it is more than just physical strength that we need. We need strength to live, strength to avoid sin and this kind of strength can only be found in Christ. No matter how tough life is, we all need some joy. With Christ in our lives, we have a reason to be joyful and happy even when our circumstances might say otherwise. We can rejoice in Christ and feel life take a whole new feeling of joy from the inside out. Without Christ real joy is never fully attained.